With Hetty, kids can go to school to discover and learn a lot of new things with their classmates. They can join Popo on the basketball court for some games while others can explore the playground with Yum. Collect all five Jollibee Fun City Jolly Kiddie Meal toys with every purchase of a Yumburger (P80),Yumburger Meal with Drink (P100), Jolly Spaghetti (P95), Jolly Spaghetti Meal with Drink (P105), 1-piece Burger Steak (P95), 1-piece Burger Steak Meal with Drink (P105), 1-piece Chickenjoy with rice (P120), or 1-piece Chickenjoy Meal with Drink (P130), each with its own Jolly Joy Box. Hurry, get started on collecting and building your Jollibee Fun City which is available until September 30, 2018, only. 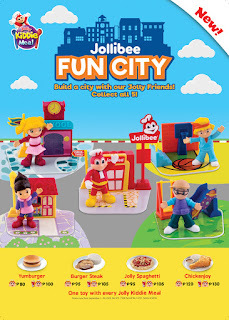 Visit your nearest Jollibee branch to complete and connect all five toys to start playing.